The cast of The World's End. Simon Pegg and Nick Frost lead the ensemble in Edgar Wright's The World's End. 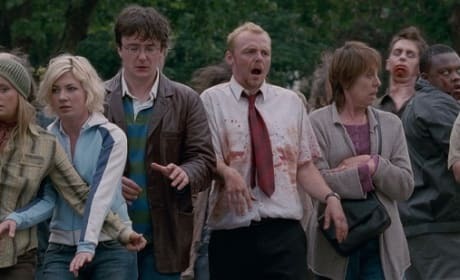 Simon Pegg walks with the dead in Shaun of the Dead. The comedy put a new spin on the zombie feature with Shaun of the Dead. 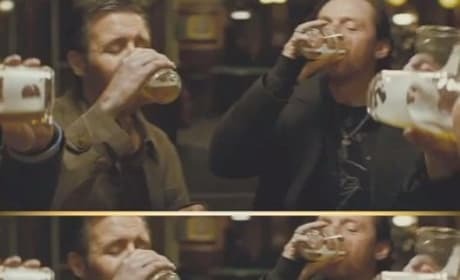 The World's End Trailer: Welcome Home Boys! As Mr. Sloan always says, there is no "I" in team, but there is an "I" in pie. And there's an "I" in meat pie. Anagram of meat is team... I don't know what he was talking about. Chief Inspector: Yes I can, I'm the Chief Inspector. Nicholas Angel: Well however you spin this, there's one thing you haven't taken into account. And that's what the team are gonna make of this.